Listening to nationally- and internationally acclaimed musicians is always a soul-stirring experience. What many San Luis Obispo County residents and visitors don’t realize is that there are such regular music offerings featuring the rich, deep musical talent that is available on the Central Coast of California. D’Anbino Vineyard and Cellars’ tasting room is arguably the premier local venue on the Central Coast for live music. The owners, John D’Andrea and Carmine Rubino, had many years of successful, award-winning careers in recording, film, and television before moving to the Paso Robles area. Growing up together in an Italian neighborhood in New Jersey as brothers (even though John is actually Carmine’s nephew), several years ago they purchased a vacation property in Paso Robles for their extended family to relax in what they described as the friendly, cozy small-town atmosphere, away from the workaday bustle of Los Angeles. The vineyard and tasting room were not originally part of their plans, but at the suggestion of their realtor they decided to grow grapes and make wine. They combined their last names to name their winery. Carmine’s son, Michael (a composer), and his wife, Sharon conceptualized the tasting room theme, focusing on music and displaying the many memorabilia and awards the men had acquired in their careers. The tasting bar cleverly incorporates parts of real pianos. The elevated stage with state of the art sound and acoustics was originally only intended for the “Family Band’s” occasional performances for special events. Carmine related that when many people visited the tasting room they would inquire when the music was being performed and were disappointed when told that there were only occasional shows. 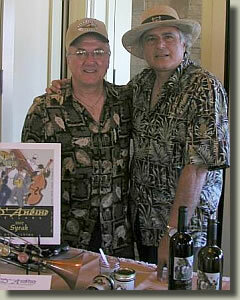 In the meantime, John and Carmine started live performances in conjunction with a monthly Paso Robles wine and arts event. As musicians became aware of the caliber of the tasting room’s music-friendly atmosphere, they began asking to play there even though they receive little remuneration. These include local, talented musicians with impressive performance resumes, but also touring and other nationally known musicians who like to perform in this friendly, and relaxed, yet intimate, tasting room. Enhancing the music experience at D’Anbino’s is Carmine’s wealth of experience as a sound engineer which he uses to actively mix the music as it is performed. D’Anbino is presently hosting the Central Coast Famous Jazz Artist Series with renowned vibraphonist, Charlie Shoemake, formerly with the George Shearing Quintet. Charlie manages to book legendary jazz musicians to perform D’Anbino’s intimate setting. During a performance in San Luis Obispo in March 2013, Wynton Marsalis, gave recognition to Charlie as mentor to the Jazz at Lincoln Center Orchestra’s saxophonist, Ted Nash. D’Anbino features their reasonably-priced seven red and rose wines crafted by Carmine from their Syrah and Cabernet grapes. Some of the wines have musical names such as Orchestration and Quadraphonic. Carmine shared a story about the Quadraphonic wine name. While working in a New York music studio, Carmine was the sound engineer for the King Biscuit Flower Hour radio show, which he did in “quadraphonic sound.” John Lennon, who was recording at the same studio, asked Carmine if he could remix John’s music in quadraphonic sound. Thereafter, John referred to Carmine as the “Quadfather,” which was around the time the movie, The Godfather, had become popular. John (D’Andrea) also has a storied history, originally being recruited to California to be the next teen idol, along with Frankie Avalon and Fabian, but when the Beatles hit the scene, young people’s interests changed. Besides playing the sax, John is an acclaimed musical arranger, composer and director. Memorabilia from John’s and Carmine’s activities and awards are on display.